The 20' Event Tent - Plain features is an easy setup, the telescopic legs snap into place and offer a range of heights, the tent assembles in just minutes! 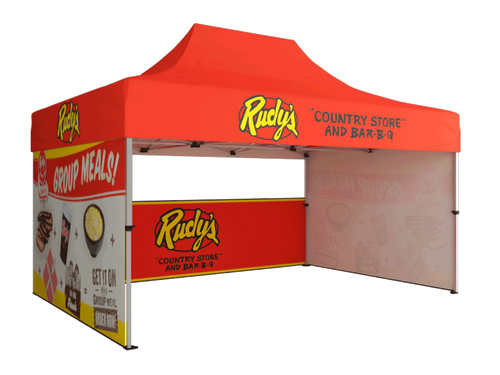 Pefect for any outdoor event, farmers market, fair, or convention, this outdoor event tent makes it easy to be up and running in minutes, and out of the sun! This Fire-Retardant and weather resistant canopy creates a comfortable environment so that you can focus on your clients. Add optional walls, and weights for increased balance and stability. Choose between 7 colors for the canopy to match your brand.